I struggled with breastfeeding my twins when they were born. I had really wanted to breastfeed them exclusively as I knew this was what was best for them. But, as with many aspects of parenting, reality is very different from the theory. With a combination of babies with tongue-tie, dehydration and weight-loss, not to mention very painful breastfeeding for me and a shortage of milk, I ended up having to introduce formula on medical advice. I was worried that this meant no more breast milk for my babies, and therefore no more of its wonderful benefits. But introducing formula does NOT need to mean the end of breastfeeding. It is perfectly possible to combine the two, as I did in the end for seven months. Combination feeding is little talked about, but it can create a more sustainable solution to breastfeeding twins. Without it I certainly would not have been able to continue breastfeeding mine for as long as I did. This was the perfect solution for me. If you top up with formula after a breastfeed it is difficult to work out how much to give, and is incredibly time-consuming. You also risk over-feeding your babies (which I did) and end up being far more acquainted with the term “possetting” than anyone should, not to mention exacerbating any colic. This way is perfect if you have help, manageable if you are alone, and enables you to measure more accurately how much your baby has fed. It takes less time than a breastfeed, so the second baby doesn’t have to wait so long to be fed. This means the baby who had the formula at the last feed will receive breast milk at the next feed. The breast-fed baby will most likely get hungry sooner than the bottle-fed one, and so can be fed first with the bottle at the next feed. Making a note of which baby had which feed can help a sleep-deprived brain keep track of whose turn it is. Don’t feel that you have to stick to any rules, including mine! Each baby is different, each parent is different, and you need to find what works for you. It’s impossible, and very stressful, to be completely structured and follow recommendations to the letter. That’s true for any newborn, and doubly so for twins. For a long time I felt guilty with every bottle I gave my babies. I thought I was failing them as a mother by not providing them with the best start. Breastfeeding is not a test of maternal aptitude. Yes, breast milk is ideal, but try to get used to the fact that it is impossible to be ideal in everything you do for your child. Babies don’t drink milk forever; before you know it you’ll have the headache of weaning and potty-training, and the breast/bottle question will feel like a distant memory. It will keep your milk supplies up, it shouldn’t over-fill one baby making their feeds too out of synch with the other. I even started giving two breast-feeds in the mornings as I had enough milk for both. They can help a hungry baby wait a little more patiently while their sibling finishes a feed. You will probably still get the odd screaming-session though. Don’t look too far ahead. If you are struggling with breastfeeding, imagining the next few months living this way can seem nightmarishly daunting. Don’t plan how long you will breastfeed for. Think about what you can manage: “I can do one more day/week” then reassess again at that stage. Just remember, if your twins have received any breast milk at all, you are doing amazingly well. Raising twins is a lot about logistics; trying to keep two babies with different personalities, appetites, needs, likes and dislikes on the same schedule is one of the hardest parts of being a twin parent. In the beginning this feels like an impossible task, and you may feel like you are losing your mind and your sense of self. You need to do whatever you can, cut whatever non-essential corners there are, in order to cope. That is ok. As long as your babies are being fed, burped, changed, with an occasional cuddle, you are doing brilliantly. Everything else is a bonus, including breast milk. 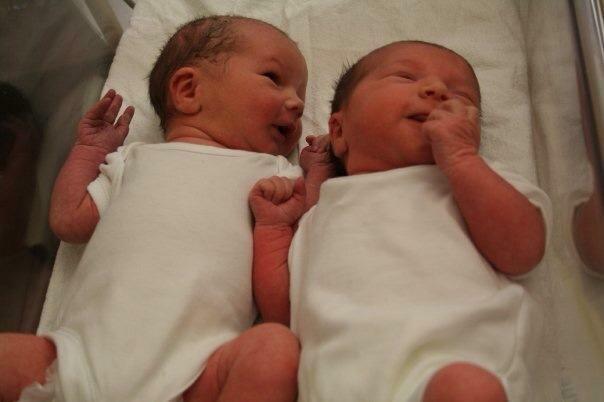 Read my full experience of combination feeding twins here. This entry was posted in Raising Twins, Top Tips, Uncategorized and tagged breastfeeding, breastfeeding twins, combination feeding, Raising twins, Twins on June 5, 2014 by perplexedparent. Thank you for this. It really has helped. I have 16 days old twins. Wanted to Breastfeed only but have started to mixed feed due to weight issues, dehydration and my exhaustion. Still feel guilty and pressured by some family so these tips have helped. I’m feeling for you! You really are going through the worst part right now but it WILL get better and easier. Try not to feel guilty – I know it’s hard. I suffered a lot from guilt and it’s really not until you get through it and look back that you realise breast-feeding is not the be-all and end-all of parenting. No-one should pressure you in this – you are the one actually living and going through this. Just take it one day at a time. Very soon your twins will be smiling at you and that’s pretty special. I wrote about my experiences, along with the guilt, in another piece on my here (blog ) You may find it helpful to read about someone who went through what you are experiecing now. Let me know how you get on, and feel free to ask me anything. I’d be glad to help if I can. Hang in there, it’ll get better!